Oscar Wilde arrived on the west coast on Sunday, March 26, 1882. His train terminated at Oakland, from where he was taken by carriage to the wharf for the ferry-boat crossing to San Francisco. He was accompanied by many members of the press and a reception committee which had ferried over to Oakland by the 8:00 AM ferry that morning to meet him. 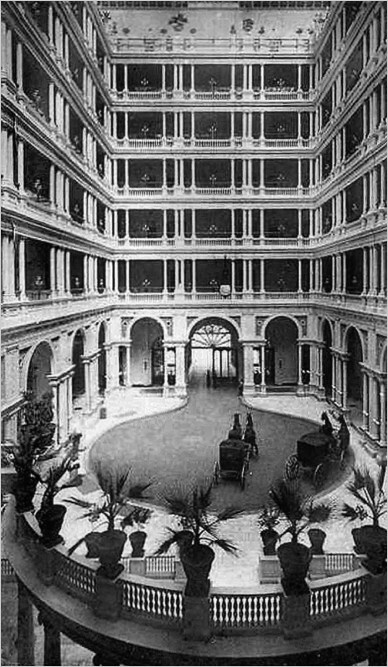 In San Francisco he was whisked away to The Palace Hotel, the largest and one of the most luxurious hotels in the world, which was to be his base for the duration of his two weeks stay in California. Visit The Palace Hotel page on my web site where you can learn more about the building, enjoy an interview with Wilde, and read one of his letters. While he was in San Francisco, as elsewhere, Oscar Wilde’s presence generated great interest, and not a little ridicule and parody. There appeared in The Wasp magazine, on March 31, 1882, a cartoon by G.F. Keller entitled The Modern Messiah. The image depicts the moment Wilde arrived in San Francisco greeted by thousands of people curious to see him, and includes several caricatures resonant of Wilde and his time in San Francisco. The cartoon is usually only seen online in a grainy monochrome. However, you can click the image to view a high resolution rendering as it originally appeared in color, together with a analysis of the featured characters and emblems. Oscar Wilde lectured ten times in California, including four times in San Francisco. Each lectured is verified and described in detail at the following pages. In comparison to previously published chronologies, one lecture date has been corrected (April 3) and one lecture added (April 8).